The Book and Record Bar owner, Michael Johnson, is an avid vinyl collector and music enthusiast. He lives locally in West Norwood and began to sell his vast record collection at Feast, a monthly market in the area. His stall was so popular that he decided to expand and open his own shop. The Book and Record Bar in Norwood High Street opened its doors in August 2013 and offers a wide range of music genres from psychedelic rock and punk, to soul and reggae. 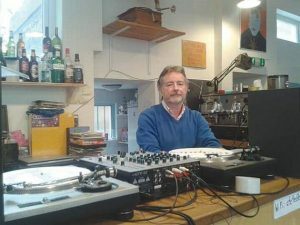 It also has soul and bring your own record nights, live bands and a radio show, the West Norwood Broadcasting Company.